13 million tons of gypsum wallboard debris are generated in the US every year, 85% of which is landfilled. In landfills, decomposing gypsum can produce dangerous gases such as hydrogen sulfide. 13 million tons of drywall debris are generated every year — 85% of it is landfilled. Landfilled wallboard produces Hydrogen Sulfide (asthmagen) in humid, anaerobic conditions. 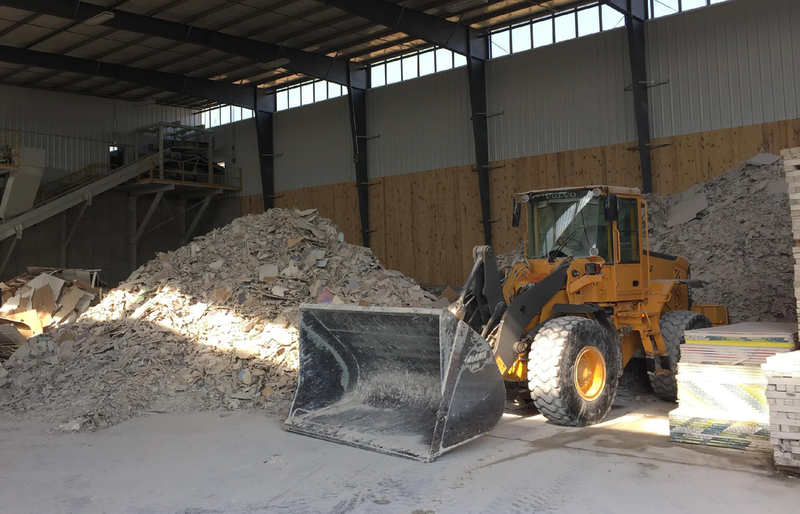 Source separating gypsum debris minimizes construction & demolition debris cross-contamination, and generation of non-recyclable fines. On flue gas desulfurization byproduct from declining coal-fired power production. Minimize potential over time for elevated mercury content in wallboard, and in emissions and effluent from synthetic gypsum production. Reducing transport emissions and cost, and supporting local economies. Repeatedly cycle gypsum rock, a high-integrity material, in an efficient circular resource system. We're currently mapping the Gypsum Wallboard Ecosystem, including projects, processors, haulers, manufacturers, and sources. Click on the points in the map below for more info.